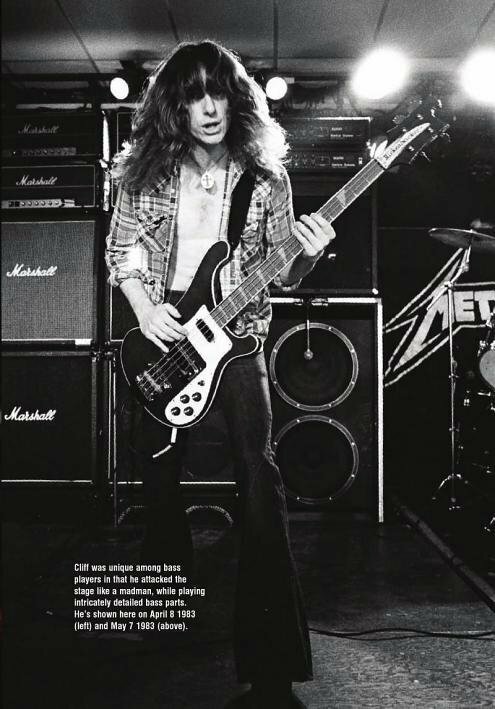 We kick off second season Know Your Bass Player with the Cliff Burton Bass Rig. Cliff Burton is renowned for his performances and musical talent in Metallica. We take a look at the gear that gave him his trademark signature sound. Starting with his Rickenbacker, Aria basses and Mesa Boogie Amplifiers. Painted with a burgundy glo finish, this bass was modified on at least two occasions. Local guitar shop owner Chuck Martin recalls in “Too Live Is To Die”* Pg 38. The first modification was made around 1982 and added a Seymour Duncan stacked single coil guitar pickup to the bridge of the bass. This is located where the foam mute would be in the bridge of the Rickenbacker and activated independently by a push-pull switch. Both Cliff and Chuck referred to this modification as the “secret weapon”. A second modification was made to the Rickenbacker replacing the stock pickups. Whilst stock Rickenbacker pickups have a remarkable tone, they lack a high output volume. Installed in the neck of the bass was a “Mudbucker”. 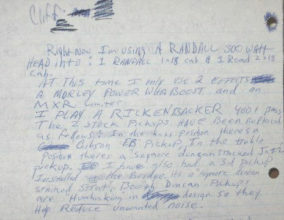 The “Mudbucker” is usually found on a GIbson EB-0* and used to the effect of a muddy boomy tone. In addition to this, the Rickenbacker bridge pick up was modified with a tapped, maroon coloured split coil. These days the pickup is now called a Seymour Duncan STK-J2B*. This Rickenbacker now resides at the The Rock and Roll Hall of Fame and Museum in Ohio. Seen in photos and footage of Metallica throughout “Kill’em All” period. Cliff was photographed briefly using an Alembic Spoiler on the Ride The Lightning tour between 1984/85. Clear video footage and dating first hand photographic evidence is difficult to find, confirming an exact time frame of when this bass was used is uncertain. Corinne Lynn, Cliffs girlfriend at the time, dates the use of this bass. Using this assumption, we can presume the Alembic was used to record Ride The Lightning which was recorded in February 1984. However there are other factors doubting the bass being used to record. Notably three other sources speak of equipment being stolen in three separate occasions. In an attempt to date the use of the Alembic, we look at a photo believed to be from the Metallica show from 7 December 1984 in Amsterdam. If correct it, shows Cliff using the Spoiler at this time. However it is difficult to confirm when and where these pictures were taken without first hand confirmation. On the other hand If the Alembic Spoiler was stolen at the start of January 1984, it would have missed the Ride The Lightning recording sessions. Taking place from 20 February – 14 March 1984. Meaning that Cliff instead used Aria Pro II SB1000 and the Rickenbacker to record. Joel McIver also offhandedly writes Ride the lightning was “Delivered on the Rickenbacker” To Live Is To Die Page 124. During the “Head That Does Not Bang” tour (November 1984 – September 1985) Cliff acquired a Japanese made Aria Pro II SB1000. The “Super Balanced” 1000 is considered to be one of Aria’s high end models with one double coil pickup and six tone positions. This bass then took over as his main bass and was used to record Master of Puppets in September 1985. Seen in tour videos throughout 1985 but disappearing after September. Ultimately by the final dates of “Head That Does Not Bang” tour Cliff was now endorsed by Aria basses. It is believed the Black N Gold I made it’s first appearance on stage in September 1985. Video footage prior to this date does not show the Black N Gold I.
Lorely Metal Hammer Festival (Germany) 14 September 1985 Black N Gold I (@ 29.00). The “Master Of Puppets” tour, now named “Damage, Inc.” tour begun late March 1986 and Cliff continued to use the Black N Gold I. This bass is distinguishable from the SB1000 by its oval inlays and gold coloured bridge. Some have listed Cliff using an Aria SB Elite which is almost identical but you will likely find it to be the Black N Gold. The body of this bass was made of Alder instead of Canadian ash like the SB1000 and In addition to this, the pickup was upgraded to an to the MB-2. This pickup was configured to sound more like a single coil pickup with less midrange and more highs. Furthermore we know from Cliff’s bass tech, Eddie Kercher, that Cliff had at least 3 Black N Gold’s with him on tour in 1986. The location of these basses is up for discussion as there are some people who claim to know their whereabouts. Cliff Burton Bass Rig and his possessions were divided up by his mother Jan. The Black N Gold held by Lars was seen at the Metallica Museum in 2013. On a picture taken an Aria fan blog (https://ariabasses.blogspot.co.uk) .They notice the pickup on this bass has been modified to be a PJ Marx pickup. PJ Marx, whilst no longer trading, was once famous for supplying then Ozzy Osbourne’s replacement guitarist Brad Gillis with his own signature pickup in the 80’s. 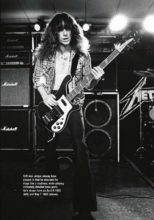 In 2013 Aria, with permission of the Burton family released a Cliff Burton tribute bass. It matched the specs of his Black n Gold to the letter and was released to the public at NAAM of the same year. This bass has a price tag of around £4000 mostly due to gold plating of the hardware and limited run. The only major changes here is that the pick up was upgraded to the MB-5, which was manufactured years after Cliff’s endorsement. With that said there has been several photographs during this period showing Cliff’s amplifiers in different stages and setups. “EZ Street” were photographed at at talent content in 1979 and on stage was the Road 2×18 as well as an Ampeg SVT-1540HE Classic Series Enclosure and original Ampeg SVT head. It is believed this Ampeg rig belonged to another contestant who coupled his rig with Cliffs as it is never seen again. 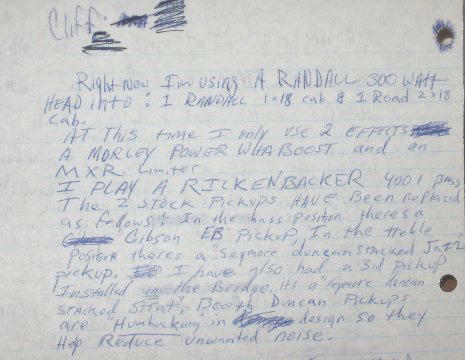 In light of joining Metallica, in 1983 Cliff hand wrote a note to the Metallica fan club. Where K.J. Doughton, the original fan club manager published the information in a newsletter. Firstly Cliff stated he used a Randall 300 watt going into the 1×18 Randall cab and a Road Electric 2×18 inch cab. Joel McIver recalls in “Too Live Is To Die” – “Cliff also bought a Randall bass amp from Chuck [Martin]. ‘It wasn’t really an amplifier that I thought he would ever use but he used it for a long time. It had a lot of power and a lot of output and it suited him'”. 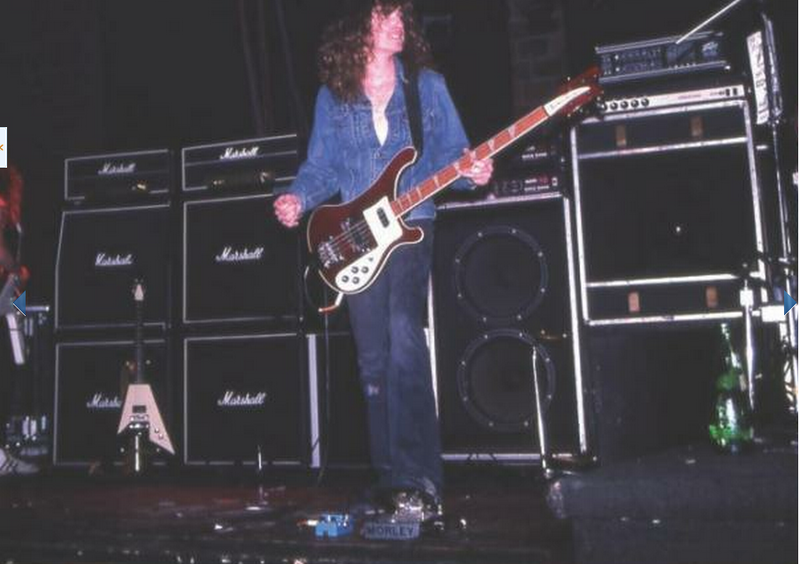 On a related note, during the Pre-“Kill’em All” period we see Cliff with what looks like two whole rigs. No where in the research for this video is any of this equipment mentioned but I wouldn’t be doing my job if I didn’t cover everything related to Cliff. There’s no context to this photo and it is possible it could be someone else’s rig on stage so your mileage may vary. On the left behind Cliff’s shoulder, Cliff now has a a second Sunn Beta head presumably for the second speaker in the Road 18 inch cabinet. The cabinet beneath this is a 15 inch JBL 4560 Bass bin. 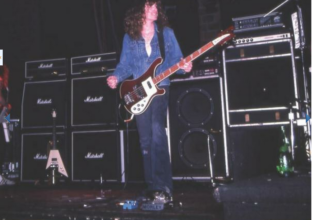 Cliff used the Randall RB-500 between the “Kill’em all” and “Ride the lightning” tours. Cliff returns to the stage with a new set of amplifiers and cabinets for the “Damage Inc” tour (March 1986 – February 1987). Not only this but he now has has two valve powered Mesa Boogie D-180 heads. According to the German source of the interview these 15” cabinets were custom made by Mesa Boogie. This set up stayed with him until his final performance in September 1986. The Cliff Burton Bass Rig has been split into two parts. Head on over to the Cliff Burton Effects Pedals for part 2. We discuss all of his effects pedals from EZ Street, Trauma and into Metallica. The Morley Wahs, Big Muff Pi’s and many many more.